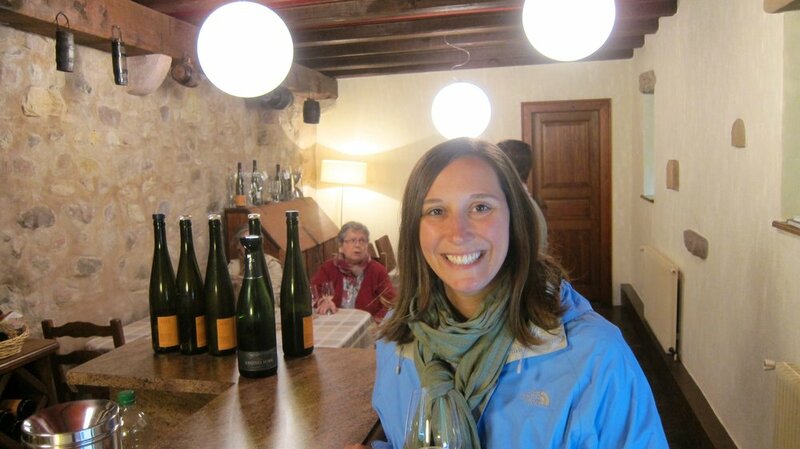 After a week drinking beer in Belgium, we returned to the wine trail in France, making stops in the Alsace and Burgundy regions. Neither disappointed. We wanted to avoid having a car for budget reasons and also so we wouldn't be drinking and driving so we picked a couple of villages where we could walk to wineries. Eguisheim is an old medieval town in Alsace that is quaint enough to make it a top tourist destination, but one that also produces some amazing white wines. The colorful, cute houses of Eguisheim. It was great to try the Rieslings of Alsace after falling in love with the varietal while drinking some wonderful Riesling in New Zealand and Australia. One of our favorite wineries, Bruno Sorg, in Eguisheim. I have to say I prefer the Eden Valley Australia Rieslings to the French ones, but only by the smallest of margins. Eguisheim is also surrounded by great hiking trails through vineyards and up into the surrounding hills. We had our fair share of fun hiking for wine (and some tastes of ready-to-harvest grapes) in the vineyards. 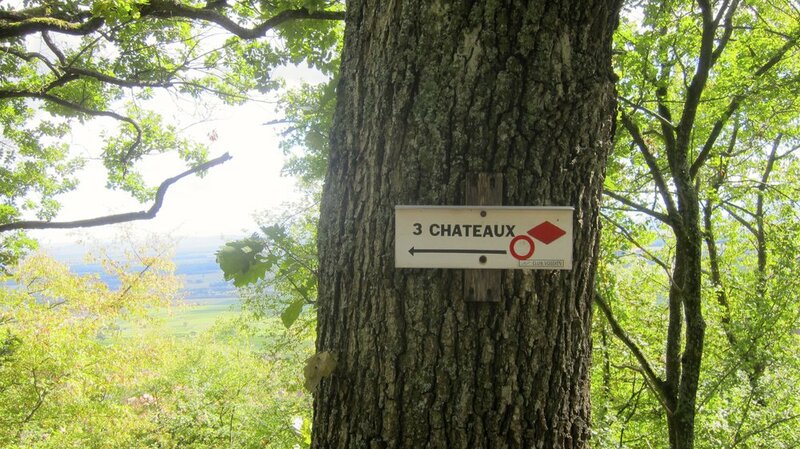 The Three Chauteauxs - a popular vineyard to mountain hike in Eguisheim. 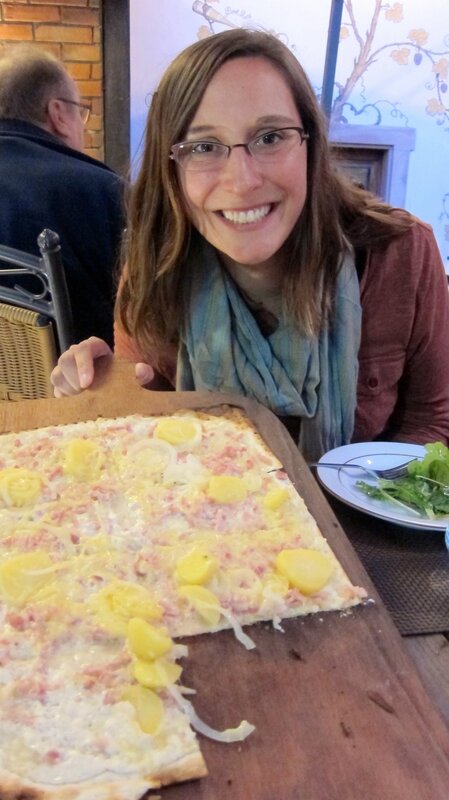 We also got to indulge in a few tarte flambées, a regional specialty of Alsace. Thin dough, crème fraîche, onions and lardons make up this incredible delight and they are served all over Alsace. My one takeaway from visiting both Alsace and Burgundy is that even though France is an expensive country, both places can be properly visited on a budget. We found a hotel in the heart of Eguisheim for around $80 a night and saw many others at a similar price. We rented a studio apartment in Beaune (near Dijon) for our three days in Burgundy for around the same price. But most surprising was the cost of the wine. Alsace, in particular, has lovely wines for between 8 and 15 Euros ($10-$20 or so), though you'll pay up for the Grand Crus. Burgundy was even more of a surprise since Burgundian wines can be so expensive. They are, but every winery we visited had a wine for 10 Euros or less. Not the highest quality, but very drinkable. Biggest bargain of all, sparkling wines from either region. We're big drinkers of sparkling, but can't afford wines from Champagne. Cava from Spain is probably still the best sparkling bargain out there, but try a Cremant from Burgundy or Alsace sometime. The bicycle trips we've taken during our travels have been adventures. From my hike/bike/puke trip in Thailand to Jill's struggles along the Riesling trail in Clare Valley, our love of bicycling has been tested. Part of it has to do with renting bikes, often crappy ones. 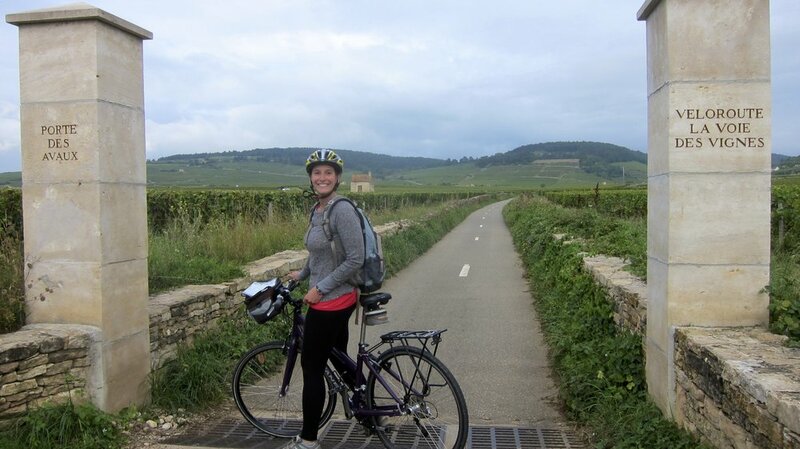 We decided to rent bikes in Burgundy and ride through vineyards on the Veloroute La Voie Des Vignes, an absolutely incredible path. The path itself lived up to its billing, our route took us 22 kilometers from Beaune to Santenay and back, out through some of the most famous vineyards in all of Burgundy. Unfortunately, my bike wouldn't let me enjoy those 45 kilometers, and the chain would slip while in second gear, causing me to curse like a Frenchman. 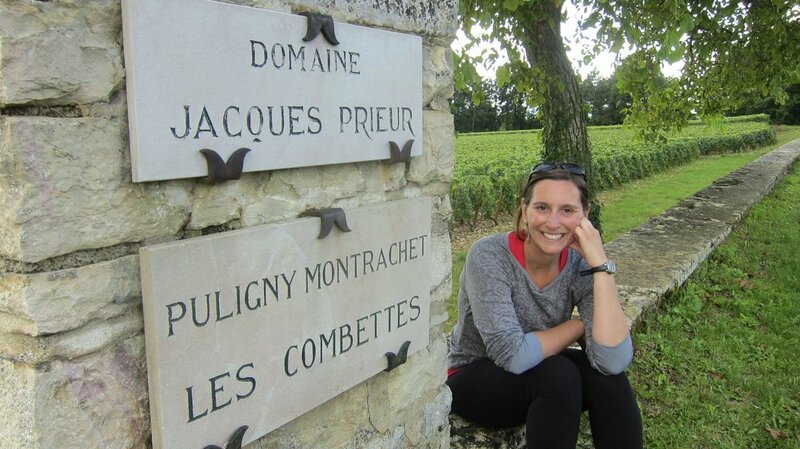 Tasting some fantastic wines at Prosper Maufoux in Santenay made things a little better as did the bottle of wine we had during our picnic in the Domaine Jacques Prieur vineyard in the famous Puligny Montrachet village. Not a bad picnic spot. I got a little upset when the guy from the rental shop tried to pin the issues on me and that I shouldn't have put pressure on the gears (not sure how I was supposed to accomplish that when going up a hill), but even that encounter couldn't spoil an otherwise unbelievable day of biking. We got to both Eguisheim and Beaune by taking regional trains in France. Touring wine country is possible without a car and more adventurous for the willing traveler!